.......53 Buddhas and Me .................My Life Adventures.....: "Festival of Mind, Body & Spirit"
What a great day I have had. 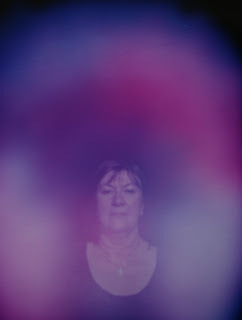 I got to the "Festival of Mind, Body and Spirit" nice and early and the first thing I did was to have an "Aura Photo" taken . How cool is it, so much pink and purple, apparently I have three Guides with me, one on the right and two on the left. The theme from this reading tended to continue f or the entire day. It was like someone was really trying to get their point across to me. The day actually turned out to be a bit eerie - same advice from varied people all day - sitting opposite a girl at lunch time and we both knew each others face but couldn't work out where, then seeing lots of people who reminded me of girlfriends. There has to be a reason for this so over this weekend I am going to call these girlfriends, just to check how they are. I ended up having a couple of readings and the questions I wanted answered were answered. I bought some beautiful crystals as well as a pack of "Wild Wisdom of Faery Oracle" cards by Lucy Cavendish - yes Michelle I bought some, couldn't resist the beautiful drawings by Selina Fenech. Michelle I also spoke to Scott and he said hello - he is really nice. Now that my day has just about finished I am feeling very peaceful and relaxed. I just want to finish of tonight by telling my family and old and new friends that I appreciate you being in my life. Goodnight. This sounds extremely interesting! I am a firm believer that everything within our lives happens for a reason, somedays we get the reasons just like that, whereas other days the reasons make no sense whatsoever. Yet in time everything seems to come together. I guess the best way to describe this in my view, life is like a jigsaw puzzle, pieces are out there waiting to be put into place and one at a time each piece is discovered and the puzzle slowly comes together, the final puzzle piece is when our purpose here on Earth has been fulfilled. This is how my life makes sense to me. Great photo as well, I love it! Sounds like a wonderful day out Davine! Davine, I am so looking forward to hearing MORE about the M,B & S Festival! Glad you met Scott, and the photo is fabulous! Guess you will be doing a reading for ME now that you have that stunning new fairy deck. LOL.